Along with periodontal (gum) disease, tooth decay poses one of the two greatest threats to your teeth. Cavities are just the start: if decay invades the pulp, the tooth’s innermost layer, the infection created can continue to advance through the root canals to the supporting bone. This worst case scenario could cost you your tooth. But we can stop this advanced decay in its tracks with a procedure called a root canal treatment. 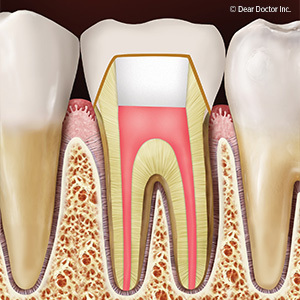 A root canal essentially removes all the infected tissue within the tooth and then seals it from further infection. And contrary to its undeserved reputation for being painful, a root canal can actually stop the severe tooth pain that decay can cause. At the beginning of the procedure, we deaden the affected tooth and surrounding tissues with local anesthesia—you’ll be awake and alert, but without pain. We then isolate the tooth with a dental dam of thin rubber or vinyl to create a sterile environment around it to minimize contamination from bacteria found in saliva and the rest of the mouth. We then drill a small hole through the enamel and dentin to access the interior of the tooth. With special instruments, we remove and clean out all the diseased or dead tissue in the pulp chamber and root canals. After disinfecting the empty spaces with an antibacterial solution, we’ll shape the root canals to make it easier to perform the next step of placing the filling. To fill all the root canals and pulp chamber, we typically use a rubber-like material called gutta-percha. Because it’s thermoplastic (“thermo”—heat; “plastic”—to shape), we can compress it into and against the walls of the root canals in a heated state to fully seal them. This is crucial for preventing the empty tooth interior from becoming re-infected. Afterward, we’ll seal the access hole with its own filling; later, we’ll bond a permanent crown to the tooth for additional protection and cosmetic enhancement. After the procedure you may have some temporary minor discomfort usually manageable with aspirin or ibuprofen, but your nagging toothache will be gone. More importantly, your tooth will have a second chance—and your dental health and smile will be the better for it.